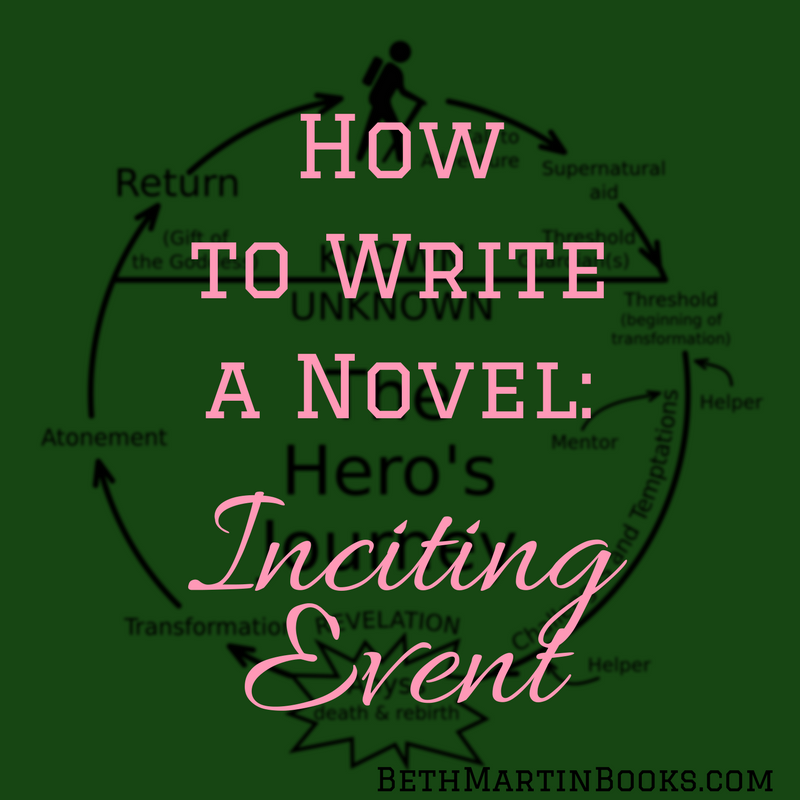 This week in the "How to Write a Novel" series, I'll be focusing on the inciting event. If you haven't noticed, I've added a link to the series on the pages bar above. There, you'll find links to all the posts in the series. 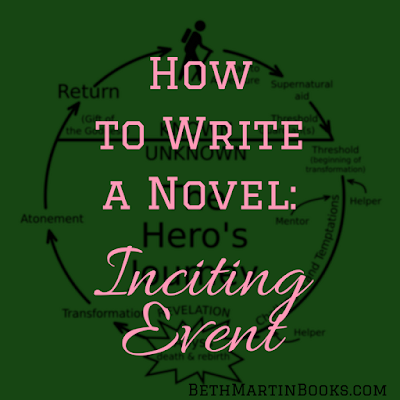 The inciting event is the thing that happens to get the main plot going. The best place for the inciting event near the beginning. After you've hooked your reader and done a little bit of world building so we know where we are, it's time to drop the bomb on what the whole story is going to be about. One of the hardest things to write for a novel is the blurb (that little description commonly printed on the back of the book used to describe the story). I'm not asking you to write the blurb for your novel just yet. What I will do is use the blurb from a couple popular books to illustrate the inciting event. The inciting event in the first Harry Potter book is when Hagrid tells him that he's a wizard. The rest of the book is following the consequences of that event. Everything changes for Wade when he finds the first clue. Not only has he started his journey towards winning the prize, but he also becomes a target to others who want to use him to get the prize for themselves. Now that we've seen some examples, let's talk more about the inciting event. Emotions are powerful for drawing people in, and when you're getting into the thick of your story, an event with a strong emotional impact on the main character will give readers something to hold onto. It could be something happy, sad, devastating, elating, or a mix of several feelings. Whatever it is, the stronger the better. If you put your character in life endangering peril, it won't have the same impact if your character doesn't value their life and in nonchalant about the danger. Show your characters fear and doubts. You'll be making the stakes feel even higher and also make your character more relatable. The inciting event should do more than just provide an obstacle for the character. You're showing the reader what's to come. One of the common mistakes new writers make when writing a novel is that they have the protagonist stumble through a chain of events without having an overlying story arc. This is why you want to start out with a plan. I love a story full of action, but the event setting up your novel doesn't have to be an action scene. It can be, but it's not required. If you're writing about a person's battle with a particular disease, the inciting event could be that person learning they're sick. If your book is about a group of kids who travel between dimensions, then the event could be the first time they stumble upon the portal inside the wardrobe. Since this is the introduction to the plot, make it interesting. Harry Potter could have gotten a letter in the mail and opened it without any fuss from his family. Be creative in how your story unfold. But when it comes down to it: write something. Just like before, you don't have to nail the inciting even when you're writing the first draft. If you find yourself suffering from writers' block already, just get something down knowing that you'll be able to go back later and add all the missing details and emotions. That's all for this week. Now get back to writing!